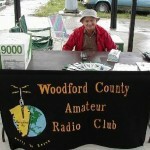 The WCARC members celebrated Field Day in 2001 at their normal location, the Woodford County Park football stadium. 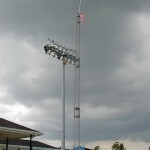 The sky was cloudy and threatening to rain. 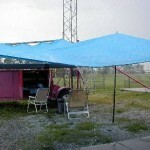 The portable antenna tower was set up and the tarp rigged as an awning just in time for the rain. The storm threatening sky provides a dramatic background for our field day setup. 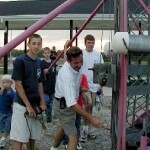 Chuck, KD4YCL, and the Wilson clan help Steve, KA4TJD, set up the antenna tower. 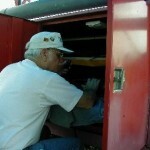 The operating position in the tower trailer is ready and waiting for the next operator. 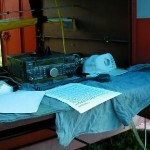 Steve, KA4TJD, takes shift on the radio. Stuart, KG4TNA, mans the public information table. As the rain comes down, the tarp shields the operating position. 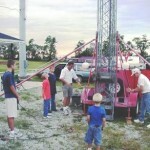 Chuck, KD4YCL, helps crank up the tower while his sons provide encouragement and suggestions. Or is he cranking down the tower?